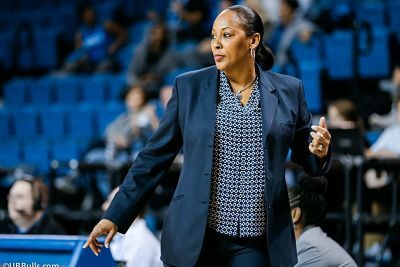 Felisha Legette-Jack is in her fourth year as head coach at the University at Buffalo. Photo courtesy of UB Athletics. Felicia Legette-Jack is in her fourth season as the head coach of the State University of New York at Buffalo, and in her 27th season of coaching overall. She was previously head coach at Indiana for six years and at Hofstra for four. She also served as an assistant at Boston College, Syracuse and Michigan State. Legette-Jack served as an assistant coach of USA Basketball’s U19 team, representing the USA at the 2005 FIBA Americas U19 Championship for Women in Tunis, Tunisia. The USA team won all eight of their games, including the championship game against Serbia and Montenegro. Legette-Jack has been to the WNIT five times as a head coach. Richard Anselmo: Congratulations on 200-plus wins, and looking forward to a lot more. Felicia Legette-Jack: Thank you so very much. You got that right. Richard Anselmo: Could you tell me a little bit about your coaching philosophy? Felicia Legette-Jack: I like to coach on character and academics, prior to basketball. You have to be passionate, a character person and be willing to learn lessons that will last you the rest of your life. You have to play basketball the same way, with passion. As long as they keep score, you may as well go out and give it your all. You have to apply those lessons learned onto the court. Richard Anselmo: It shows in the way your team plays. Felicia Legette-Jack: Well, thank you. Richard Anselmo: Coming from a program like Indiana, what were your thoughts when you first came into the MAC? Felicia Legette-Jack: Well, I was at Hofstra, another mid-major as well. I made a lot of stops in my 27 years of coaching. When I arrived, Bowling Green was the cream of the crop in the conference, and I saw Toledo doing a lot of good things as well. It’s very cyclical. It’s a very balanced conference and there are some great coaches at this level. The head coach at Toledo coached in a major conference. The head coach at Central Michigan coached at Auburn. The coaches in this league can coach at any level. I love the people at Buffalo; it’s not the same as coaching at a place like Indiana or Michigan State. The support staff here is outstanding. They are wonderful people you can grow with and I consider them a family. I got this from Danny White, our athletic director. His administration, along with the president of the university make me feel like I can thrive here. It’s all about the people. Richard Anselmo: What steps do you feel can be taken to get more people to the games? This is such a fun team to watch. Felicia Legette-Jack: It’s a Catch-22, you know. This is a blue collar city that really supports their professional teams. People are more apt to spend their time with you, if you win. Once you start winning, they will support you, but that’s where the Catch-22 comes in. You need the crowd support to give you energy. The best thing for us to do, would be try to go out and win more games, so the people will say “let’s go check out that college team”. It’s a pro city, you know, with the Sabres and the Bills. The men’s team did a good job getting to the NCAA Tournament last year, and the crowds got a little bit bigger for them. We have no history in women’s basketball. The farthest we’ve ever been is to the WNIT last year. That was the 1st time in the history of us as a Division 1 program. It’s only been about 19 or 20 years that we have been in Division 1. I see people looking and realize they’ve picked me out. The more you go out to restaurants, people notice you there, so we’re getting there. We have to continue to work hard and I think people will come. Richard Anselmo: I really hope they do. It’s all anyone had to do was see the Bowling Green game. That game made our heart race! Felicia Legette-Jack: That’s so cool! It did the same thing to my heart. I love how resilient this team is. We’re so young, we have 1 senior, and a couple of juniors. We are mostly sophomores and freshmen, and we’ll have more young players coming in next year. I just love the youthfulness of my team and the energy of my staff. I really am excited being here in Buffalo and working to grow this program with the support of the athletic staff. This is different than it was at Indiana, where you’re always looking around. The situation always made it that tough there. Here, I see everyone is all-in and are behind you, no matter what. The fact that people are there for me helps me thrive as a coach. Richard Anselmo: It’s getting more and more impressive watching this young team come together. Felicia Legette-Jack: Thank you so much, that means a lot. Thank you. Richard Anselmo: It’s impressive to watch this team defensively. They are relentless. Could you tell me about the evolution of this team buying into your defensive philosophy? Felicia Legette-Jack: You can’t play for me unless you’re willing to work hard on the defensive end. It’s like defending your home, you have to lock the door, you just don’t let people in unless you want them to get in. That’s the same kind of way we approach our defense. You’re not going to just come in, we don’t want you to. We’re not going to allow that to happen. It’s easy when you compare it to their living space, because they can relate to that and it seems to be working. You miss assignments defensively, and you’re coming out. That’s what I embed in them; this is not just a game. I’m trying to grow girls into young women who can eventually become a CEO or a COO of a company. In the future we’re going to have some successful people out there from Buffalo. Richard Anselmo: Thank you very, very much for your time. Felicia Legette-Jack: Thank you very much for your support.